"Q1 Stock Market Outlook: We’re Gonna Need a Bigger Slide"
As you can see, we’ve now reached the chart’s critical juncture—at this time of the calendar in 1962, the post-election rally was ending, and the Slide was about to begin. Our chart begs the question: Will the similarities continue and lead us into a Trump Slide in early 2018? Or, with less drama, you might like to hear my Q1 stock market outlook. But the historical performance didn’t persist after the 1980s at the same exceptional standard. 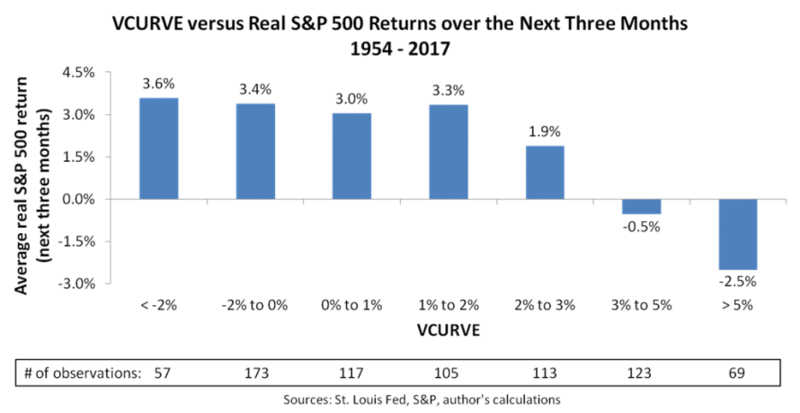 The lower panel shows the correlation weakening, with jumps in VCURVE becoming a fifty–fifty proposition as to whether they signal a market correction. 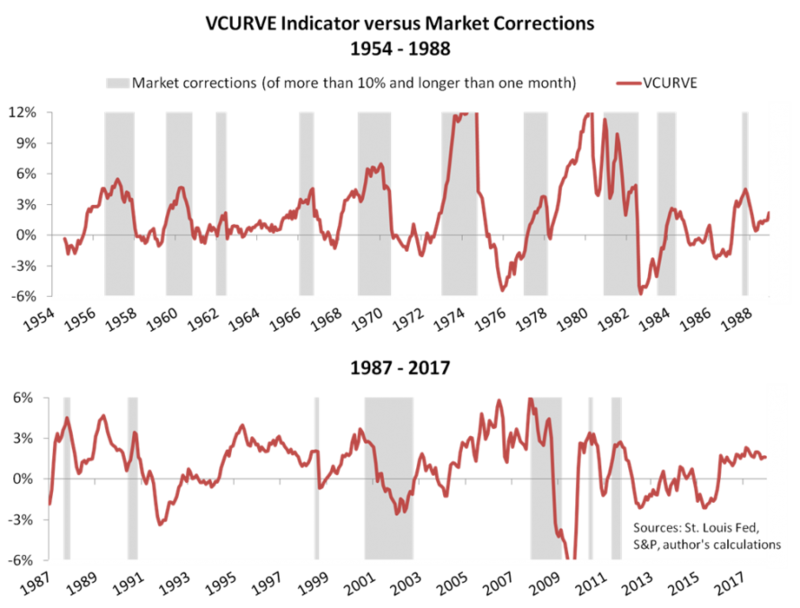 The reason for the weaker correlation is open to debate, but I would say it’s explained mostly by the Fed’s practice of jumping to action at any hint of market turmoil. VCURVE probably hasn’t shown the same predictive power under the FOMCs chaired by Alan Greenspan, Ben Bernanke and Janet Yellen because of the respective Greenspan, Bernanke and Yellen “puts.” Whereas VCURVE before Greenspan was as reliable an indicator as you’ll find, more recently the Fed’s plunge-protection game often wins the day. So VCURVE has three qualities that make it an effective indicator. It’s conceptually relevant, easy to calculate and historically proven. And what does it tell us today? At first glance, the latest reading is ambiguous. It’s higher than it was between 2012 and 2015, but only modestly so at 1.6%. To glean more information, we’ll take a closer look at the indicator’s history. The strongest real returns tend to follow VCURVE readings of less than 2%. Real returns don’t normally fall below zero until VCURVE jumps above 3%. We shouldn’t bet all our chips on the exact thresholds of 2% and 3%, history not always repeating and all that, but the pattern gives us a reasonable guide to early 2018. The latest reading of 1.6% falls within a range that’s followed by real quarterly stock returns averaging over 3%—hardly a bearish signal. More broadly, two particular risks pose the greatest threats in early 2018. First, the market may have run too hot since Trump’s election, leaving investors overextended and unable to push prices higher. An overbought market appears to partially explain the Kennedy Slide of 1962, and a similarly overbought market today could spark a profit-taking correction. Second, the Fed’s determination to tighten policy should continue to push VCURVE higher, even as it’s not especially high today. To be sure, rate hikes alone are unlikely to make a difference until later in 2018 at the FOMC’s projected pace of twenty-five basis points every four months, but further hikes coupled with an unexpectedly large jump in inflation would be a different story. In a rising inflation scenario that shows the Fed falling behind the curve, a correction of at least 10% would be likely and we’d probably see a full bear. On a three-month horizon, though, most of the best indicators favor continued strength. Credit markets aren’t nearly as threatening as they were before recent bears—delinquencies, credit spreads and bank lending standards are all either neutral or just mildly bearish at worst. Moreover, the real and financial economies appear settled into a “virtuous” loop of mutually reinforcing strength, as I discussed here, while the GOP’s tax cuts should help sustain that loop for awhile longer. And lastly, the Fed’s inch-worming monetary tightening pace hasn’t accumulated enough force as of yet to push VCURVE into a danger zone. As possibly the most effective of all fundamental indicators, I don’t recommend betting against VCURVE. All things considered, I expect market valuation to become even more expensive before the next correction takes hold. 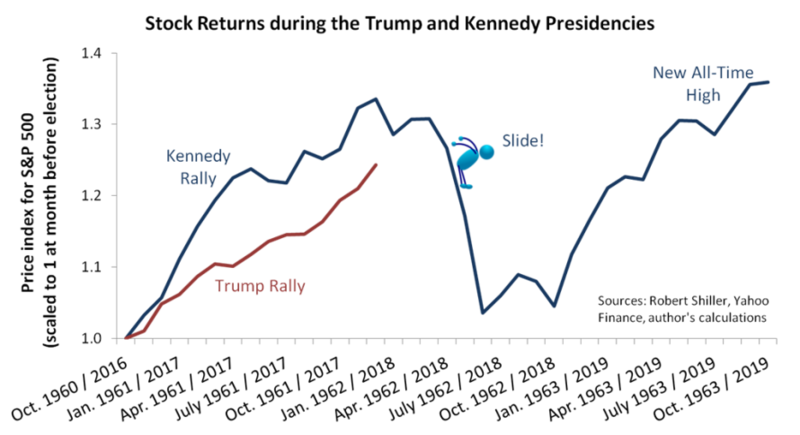 Comparing the Trump and Kennedy rallies—as in the first chart above—I expect Trump’s market to build an even bigger slide.